A young creative team have come up with a fun way to compare Campaign's best creatives of 2017. Kudos to the creative team Adela and Molly, currently at Karmarama, for gamifying the Top 20 Creatives from the Campaign Annual. 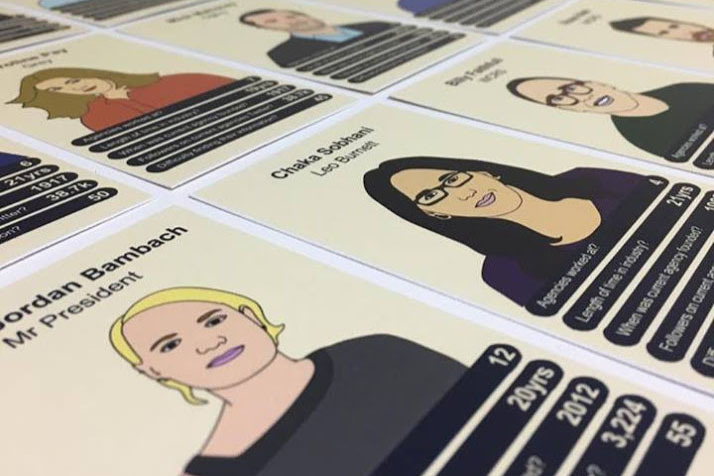 The pair have created a Top Trumps version of the list, which they have sent to every one of the creative directors featured. The creatives are measured on various metrics including the number of agencies worked at, tenure in the industry and difficulty in finding their information. We’re sure that Adela and Molly will go far. Looking for last-minute stocking fillers that are unavailable at your nearest petrol station forecourt? Well, you could do worse than buying the latest offering from the personalised book company The Book of Everyone. Set up by three former admen – the creative directors Jonny Biggins and Jason Bramley formerly of Grey London and Steve Hanson from Kessel Kramer – the book Wise(ish) Words allows anyone to package up their titbits of advice for the young people in their lives and place them under the tree this Christmas. Even better, WellChild, the national charity for sick children, receives £1 from every book sold, helping seriously ill children get the chance to thrive at home with their families. And on that seasonally uplifting note, Merry Christmas!